(verb): To place money you can afford to lose in a risky venture, with the hope of making a gain. (verb): To place money you don’t want or can’t afford to lose in an account with guaranteed safety and growth, with the knowledge your money will grow. The market goes up, the market goes down. 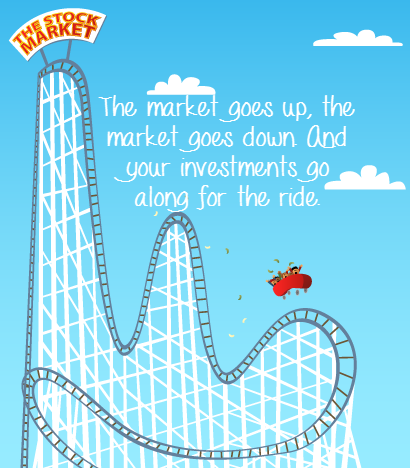 And your investments go along for the ride. You may not realize that even one bad year – just one year of only moderate loss of capital – is extremely serious. It takes more time, a higher rate of return, and increased risk to recover. (For example, when you lose 30%, you need a gain of more than 42% to recover to where you were.) And you have no idea how long it will take you to recover… if you recover. Wouldn’t you agree that the return of your money is at least as important as the return on your money? It’s interesting to note that in the tortoise and hare game scenario, the savings vehicle could earn as little as 3.5% per year and still beat the investment account. Your principal and growth are locked in. You don’t go backwards. With a Bank On Yourself-type policy, all fees and commissions are already included in the bottom line numbers and results you see in your policy. There are no surprises. Whether you’re investing in a 401(k), and IRA, or any other brokerage investment account, you are paying hefty annual fees. Imagine handing over as much as 5% of the value of your investment account in fees, year after year. Whether your nest egg grows or shrinks each year, you pay fees: purchase fees, account fees, redemption fees, service fees, exchange fees, management fees, and something called “12b-1” fees. (12b-1 fees let funds pass on the cost of their TV commercials to you!) Even no-load funds have fees. Bank On Yourself-type plans generally allow you to get your hands on your principal and growth with no taxes due. Not only does your money in a Bank On Yourself plan grow safely, it is also liquid. You control the money in your plan – not the government or a plan administrator. Qualified retirement plans such as 401(k)s and IRAs have more strings attached to them than a puppet. Plus, you can access your money only if you are willing to sell the investment that you’re counting on for growth. Just because you may need the money is no guarantee it will be the right time to sell your asset. But when you use a Bank On Yourself policy to finance purchases, the money you use still grows at the same rate. A Bank On Yourself Authorized Advisor can coach you throughout your lifetime with strategies for using your policy to maximize its growth. The Bank On Yourself method is based on an asset that has increased in value every single year for more than 160 years. Learn more about it here. Want to find out how to grow your nest egg guaranteed and predictably every year? Request a free analysis and get a referral to a Bank On Yourself Authorized Advisor to find out how much your financial picture could improve if you add Bank On Yourself to your financial plan. Boston College Center for Retirement Research. Policy loans accrue interest, and they lower cash value until repaid. Death benefit is reduced by the amount of any outstanding policy loans and interest due on those loans. Excess unpaid loans may terminate a policy with tax consequences.